An humble attempt to sing the praise of a great Acharya whose 1000th year celebrations are about to be celebrated now. Amuthanar says that the egos which generally put down every person that of false pride of born in high caste(jananam), being blessed with good education (jnanam) and that of being a strict follower of vairagyam and anushtaanam were won by Azhwan. He was able to devoid of pride though he possessed all these qualities. 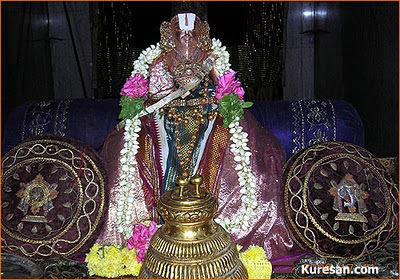 After taking refuge at his feet, Amuthanar says, he is able to compose the greatness of Emperumanaar who will enable all his disciples to get over bondages and hence there would not be any grievance or regret. Num Swami was born on Thai Hastham in Kooram village near Kanchipuram. He was the King of Kooram and every day he organized feeding bhakthas in a grandiose manner. After realization, he renunciated all his material wealth to the poor and set on foot to Srirangam. There he identified his noble Guru, the enlightened Sri Ramanujacharya, obeyed him and became the choicest and most celebrated disciple of him. A strange bond of kinship developed between master and student over the years. Kuresar was Ramanuja’s aide in scriptural study, disputations and exegesis acting as a faithful shadow. At that time, Mahan Ramanuja was generating a great religious movement and his philosophy ‘Visishtadvaita’ was attracting universal attention. He was institutionalizing his philosophy and set about writing down the principles later known as ‘Ramanuja darsanam’. In this he was assisted by the principal disciples – Kuresan, Dasarathi, Devarat and Embar. Then Ramanuja embarked to record his commentary on Brahma sutra of Vyasa and Kuresan began writing down every thing as dictated. In such a manner he completed stupendously the great standard works of Sri sampradayam handed them over to posterity – Sri Bhashya, Vedanta deepa, Vedantasra, Vedartha Sangraha and Gita Bhashya. Ramanujacharya in order to lend irrefutable authority to his commentaries on the "brahma-sutras", needed to consult with ancient texts and treatises that could be actually shown to expressly affirm some of the the fundamental postulates and theses of VisishtAdvaita and wanted to access ‘boddhayana vrutti’ – a rate treatise on Vyasa brahma sutra. This was lying somewhere obscure in a Kashmiri state and at an advanced age Ramanujar undertook a digvijayam by foot in pursuit of the vrutti and propagating his message. Kuresan also accompanied him. To gain access to the library, Ramanuja put for his exposition of his philosophy and defeated the royal pundits in debate. Enraged, the pundits threw up a plot that they would not allow the vrutti to be taken out of the library precincts and that the Acharya would not be allowed to take down any notes from the vrutti.The royal pundits however were none too happy about the King's generosity and played malicious mischief to frustrate Ramanuja. Thus there were disappointments at Kashmir and when back in Srirangam, Kuresan by sheer power of his prodigious memory was able to accurately recall vast passages from the vrutti word by word helping the great Acharya. The commentary of Acharya on Vyasa’s brahma sutra quickly progressed to its conclusion. Ramanujar had the ambition of fulfilling his promises to his guru Yamunacharya one of which was to propagate devotional literature of Azhwars. At that point of time, Kuresan who was born as a king was earning his daily bread by unchavratti and was collecting noting more than sufficient to satisfy the basic needs. 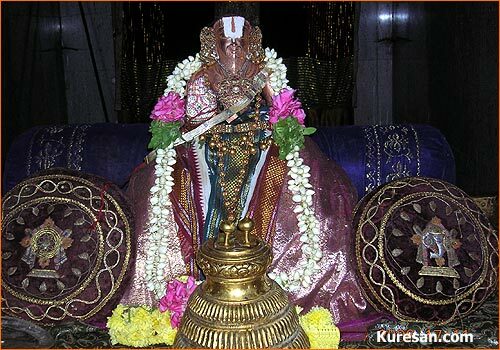 Thiruvarangar once directed Uthama Nambi to take his prasadam to Kuresan for he had not eaten anything on that day. Kuresan considered it a sin to ask for something from the Lord for such was his devotion that he was sure that Lord would shower everything on his benefaction and baktha should not think of asking. Legend has it that the food sent by Arangar was the reason for the birth of two great sons, who were named Vyasa Bhattar and Parashara Bhattar who in posterity became the natural heir to all the spiritual kingdom of Ramanuja. Sri Ramanuja and Kuresan were septugenarians when the Chola kingdom was ruled by tyrant Kulothungam who was to be known as kirimikanda chozhan. He was bent on rooting out Vaishnavism and trying to destroy Ramanuja issued summon to Acharya to appear in his court to punish him in some manner. Getting wind of the king’s evil designs, the disciples dissuaded Acharya from going to Gangaikondachozhapuram and Kuresan volunteered to go as His proxy. With great anguish the Acharya left Srirangam to the land of Melkote and lived in exile for over 12 long years. In the court the king thrust a written declaration which read ‘nothing higher than Siva exists’ and commanded Kuresan and Perianambi to affix their signatures without any protest on declaration. Kuresan magnificently cited authoritative texts and sources from Vedas, Upanishads, and Puranas proving that Sriman Narayana is Supreme and none was higher than HE. To a Srivaishnavaite He is the only one fit for worship. PramANam (authority) and Anubhvam (experience) how EmperumAn is THE SARVESHWARAN. THE POWER OF POSITIVITY : Heard from knowledgeable sources that the sthavam on Azhagar though written at a stage when he was suffering with blindness, old age and being away from his Guru, he vowed to praise the Lord without any self-pity and everything is only positive in his writing. Such was his will power and devotion to Almighty and Acharya. It is stated that Kuresan lamented that losing eyes was perhaps an atonement for some sin committed – perhaps some comments on urthvapundram on the forehead of a srivaishnava. Such was his selflessness and attitude of not complaining. Kuresan despite the great physical handicap continued all kainkaryam and remained eternally faithful shadow of Acharyar. Ramanujar took his dearest disciple to Lord Varadharaja and commanded Kuresan to pray for restoration of eye sight. Kuresar did not want the eye sight for seeing anyone else than his Acharyan; when Ramanujar commanded, he prayed that moksham be granted to himself and also to Nalooraan, a person who had sort of betrayed the Acharyar before the Chozha, wishing that all srivaishnavaites be blessed. Such was his benevolence even for those who had done harm. Suveeryam (power to engage all enemies all alone against a multitude of enemies),Souryam (independent prowess that enables Him to meet the enemies at his own base and destroy them), KrutitA (joyous attitude after placing those who sought His protection by His side in Sri Vaikuntam),Gaambheeryam (Majesty), CAturyam (conductance with exemplary cleverness and diplomacy with all) His unparalleled beauty blends with these auspicious and limitless guNams at His divine abode of ThirumAlirumchOlai. Let us fall at the feet of Kuresan and pray for all good things from him and from Ramanujar. PS: the cinema ‘Dasavatharam’ might have been well taken, Kamal displaying all his talents but the dialogues and intense abhorrence for Hinduism and its values are apparent. Though there are many historical blunders and abject wrong portrayal – the character of Nambi does instill interest and some good depiction of the steadfastness and mental strength of a Srivaishnavaite. 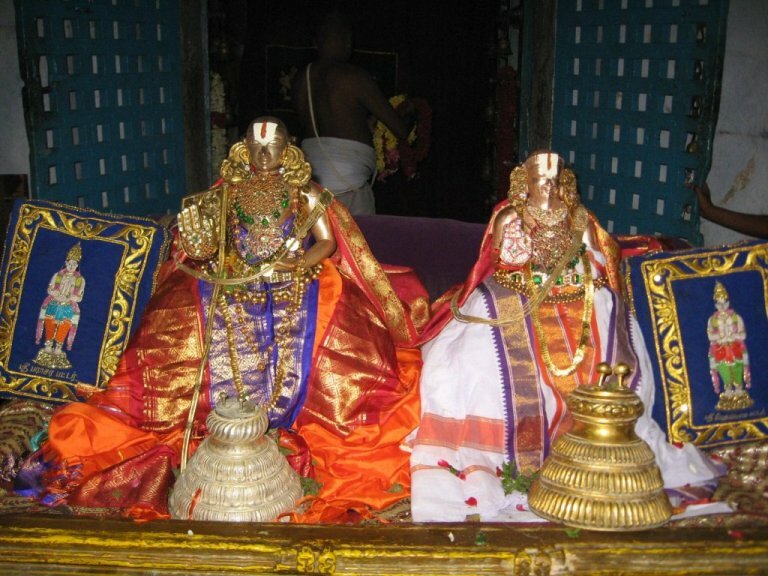 ‘Adieyn Ramanuja dhasan’ – enum vaarthai Srivaishnavargal parimarra chol. 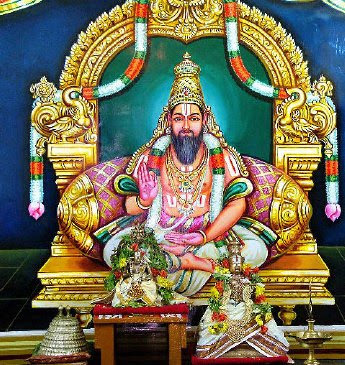 I belong to the clan of Sri koorathazhwan, --Vedavysa bhattar vamnsam..it was a great pleasure to see this blog and especially the portrait of Sri Alzwan..
planning to visit kanchi on 1st,kindly give the route of kooram from kanchi and distance how far is it?my mail id is janaram58@yahoo.co.uk.thanks janaki.